Burko: Jen, I am always so impressed with the quality ofyour work and the professionalism of your business practices. I am curious, how did you get started as a graphic designer? Hill: Oh thanks Jessica! I went to MassArt in Boston and studied graphic design. I had always wanted to go to art school and always liked working with text / image / drawing. Once I graduated I went on to design for the beauty company, Fresh and then left to start my own business. Burko: Did you learn how to run a business while you were at Fresh? Or is that something you studied at MassArt? Hill: I learned a lot at Fresh. It was started by a couple of entrepreneurs, and one of the owners was my creative director. She also became a mentor to me, which was really great. I got to design but also see the decisions involved in marketing, PR, cost analysis etc... I don't know if you could learn that all in school! Hill: What about you? How did you make the decision to start focusing on your art and your business of marketing and design specifically for artists? Burko: I have been studying photography and making art since 1985 and began working in the industry in 1990. Once I was in graduate school I worked for the photo gallery at RIT and interned at the George Eastman House museum, through these jobs I started learning about the “other side” of fine arts that working artists don’t usually get to see. Once I moved to Boston I working in private galleries and started doing a lot of graphic design and marketing for shows, this type of work continued when I was hired as Gallery Director at Stonehill College. After six years at Stonehill I realized that artists really need help with self-presentation and marketing of their work so for the past year and a half in addition to making and showing my own artwork, I have been working with artists and arts organizations to help them achieve their professional and creative goals. Hill: That's so great. I have designed websites for artists, but haven't done much marketing / branding for artists - other than myself! What unique challenges do you think artists face when it comes to marketing and branding their work? Burko: I think artists want to spend time on their art, not on "busywork" like developing a visual identity and promoting their creative efforts. So it is often a challenge for a working artist to change their focus long enough to develop a marketing plan, and it becomes a challenge for me to work with artists on projects when they would much rather be working in their studio! I am lucky though, that the clients I work with are committed to their art AND their arts careers which makes projects flow more easily. Jen I’m wondering, how have you found so many wonderful outlets for selling your cards, prints, and notebooks, and what are some of the most recent venues that now carry your work? Hill: Well, I started doing the Jamaica Plain Open Studios in 2006, and at the same time I also emailed information and images of my work to some of my favorite design blogs, Decor8, Oh Joy!, and Design*Sponge, and they all wrote really nice pieces about the collection. From there I sold primarily off my website and one calendar was sold to a reporter from the Hartford Courant. The reporter wrote a nice story about unique calendars and it was picked up off the news wires by about six other papers across the U.S. That was really big and got me thinking about not only selling from my site but also selling wholesale through stores. I researched different papers and design stores across the U.S. and contacted them about my line. So far the line has been picked up by Composition in Denver, Magpie in Sommerville, the San Francisco MOMA store and a few others. Burko: Very Impressive! Which designs/types of work do you feel is most popular, and which is your own favorite product? If you have one! Hill: Both the wall calendar and the desk calendar have been really popular, as well as the prints. The Champagne, Pondicherry and Kanyakumari patterns have been the most popular for 2006's patterns. For 2007 my favorites are the Rome print about gelato and the Prairie City print about he tall grass of Iowa. But they are all like children to me, hard to pick a favorite one! So how do you get your work out there? What kind of marketing do you do and do you sell in stores/galleries? Burko: I have always showed my artwork in galleries. I've had solo shows, and have been included in juried group shows, but recently I have been exploring art fairs and other non-traditional types of venues. The results have been pretty good, but I prefer bringing work to a gallery rather than setting up tables, easels, and a tent! My work is not carried in retail stores because each piece is an original, one-of-a-kind collage. Hill: Mmmm... yeah the art fair setup, especially for fine art, is not fun at all. I generally dread doing shows (it does take a good deal of time) but I find that it is really important for my work to get direct customer feedback. Plus it is always nice for me to meet people in person who have purchased from my site and chat with them. Burko: I agree with loving the conversations sparked at shows, which is why I participate in Open Studios weekends in Boston. This month, I’m doing the South End Open Studios and the Jamaica Plain Open Studios. I love that I can hang out all weekend and talk about art and creativity while selling my work. Are you doing one of the Boston Open Studios weekends? Show held at the Maliotis Cultural Center. Both the juried show and the open studios were a lot of fun last year so I'm totally looking forward to it. Burko: Awesome! Will you be showing any new designs? Hill: I will, I'll have the new 2008 Wall and Desk Calendars there and a bunch of new patterns. What kind of work are you showing at the open studios? 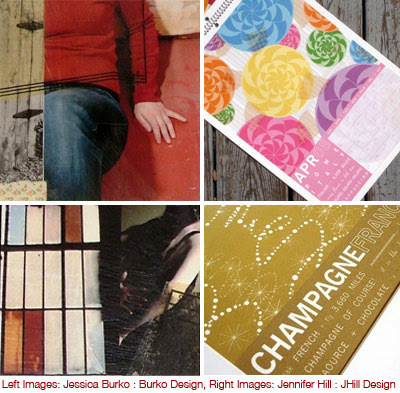 Burko: I have several new collages that involve more found papers than incorporated into my previous work. These papers have added new colors, since I tend to utilize a limited color palette. I'm curious, is there a theme to your 2008 calendars? Hill: There is! My collection is called "Places I Have Never Been" and it is inspired by my imaginary vacations. I research different places I haven't been to and then do a pattern drawing from my imagination. Burko: That is such a wonderful and unique idea! How did you first come up with it? Hill: Well it was a couple years ago and I was driving to my family's home in New Hampshire late at night. I had been thinking of wanting some sort of concept to build a calendar around. I was listening to a song by the band Modest Mouse and one of their lyrics is "we named our children after towns that we've never been to" and I though how fantastic that was. Then I started thinking about all the places I haven't been to and it kind of grew from there. What about you, what inspires and influences your work? I love how you combine text and image in some of your pieces. guide my creation of the visuals. Hill: I love the writing. It looks like you figured in some of your work. Is it you? Burko: Actually no. I say that I do "portraits of self" rather than "self-portraits" because I always use friends as models to ‘stand-in’ for me. They wear a dark wig that looks like my hair, and often wear my clothes. I find that when I photograph models instead of myself that I am able to better construct the photographs. I also use slow exposures when I shoot, and I have my friends/models quickly move parts of their bodies so the film shows a blur - this way motion is captured, emotion is expressed, and identity is obscured. Burko: It's definitely effective! But I never know what I will actually get during a shoot, so for every one print that I make there may have been 5, 10, or more frames shot. Jen, it's been so great learning more about your work and your business - thank you for 'chatting' with me today! Hill: Thanks for chatting with me Jessica! Great interview, ladies! I love that the idea for "Places I have never been" came from a Modest Mouse song. Never knew! Ha...I'd love to be a fly on the wall in MORE conversations between artistic people :) Thanks for sharing!